Drift Eyewear out of Chicago, IL wants to take you, eyeglass wearer, on an adventure through the intricate history and time of design. Drift was founded by former engineer and non-designer Chris Manz — who modeled the initial frames after the architectural idea that the weight of a building’s walls should transfer back to the core of the structure. 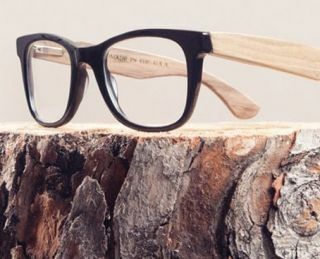 Beyond honing in on this smart, simplistic technique, the Drift Eyewear uses locally sourced wood and other eco-friendly materials. That doesn’t sound like a big deal in this day and age, but the wood is used correctly, intellectually — in all the places it makes sense. A patent pending stell core strengthens the frames, maximizing durability and weight distribution. Not a complete wood-shell: and thus not a ticking time bomb for a glasses disaster. We’ve all been there. But enough of this technical talk, the wonderful compatibility of the structure: let’s get to what’s really interesting about the fashionable frames. And that is each frame’s purposeful, story-built design. The Drift Timber Collection, for example, boasts three frames made from salvaged wood scattered across the United States. The darker hues of the collection are brothers, torn from an old NYC meatpacking building by designer Daniel Gray Faires — thus holding the texture of a tormented age; the white-painted hues were taken from old picket fences out of Chicago — vintage and picturesque and rescued by Chicago designer Raun Myn. The raw, grainy aesthetic was pieced out of a Seattle art gallery, based on collaboration with artist Jessica Park. These timeless glasses weren’t spit out of a machine. They were constructed, chosen complicity, for their story. And thus, only a hundred pairs of each are available for sale. Your hipster chic frames won’t boast the same story, the same fine texture and grain, as the manufactured frames across the room. Take this one step further: Manz’s innovative team has found quite a story buried beneath time, water, and soil in its creation of Drift’s exclusive Delta Blues line. The look is powerful in itself: it takes hard, dark and serious nerd fronts and couples them with light wood temples. The look invokes simplicity yet stoicism: much like the music it invokes — the Jazz and Blues. Much of the current Blues, like the frames, stem from Chicago where its importance is implemented. But the original blues grew up in the Mississippi Delta, where the stuff of the frames was born. 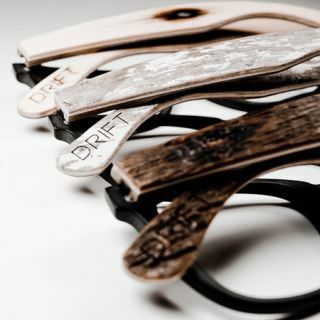 Drift Eyewear specializes, of course, in hand crafted sustainable wood eyeglasses frames, and thus researched the Mississippi Delta region, the self-proclaimed southern-most part of America. A hundred years ago, loggers flocked to the area to float cypress logs down the Mississippi. Trees without the proper mass sank right to the bottom of the sweeping river and stayed dead in the current: sort of soaking up ages of minerals, mud, and this initial time of early century blues. With nothing else to do, the loggers would listen to blues musicians play intimate concerts in the woods: going north, the music changed, formed with the century. The logs changed, too — in coloration and texture. These Delta Blues frames hold a story within their wooden temples: significantly wrapping a lifetime of music around the ears. So allow your frames to be different than those stock glasses of your peers: put your peepers in the hands of innovative craftsmen in Chicago — tinkering away in a 2000 square foot studio next to Lake Michigan with the real tools of design: sensible architecture, shaded and colored with a sense of story. What old building, what tall, arching tree, has not leaned with the wind, with the time around it? Use these frames with the time-proven knowledge to see the world around you. 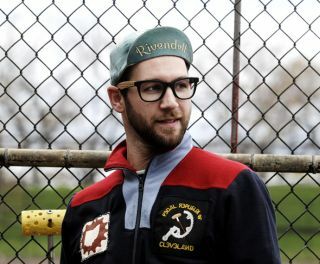 Make like the hipster-chic and nerd glasses of today and pair old with the new. And help to remain eco-friendly, for continued use of our resources into the future of Drift design — and other companies who also shine this same light. After all, Drift is slacking on no end of the environmental spectrum. Even their plastic fronts are formed from a wood pulping process. And with a whole line of different textures, firm, stoic colors — colors grown from the world — it shouldn’t be difficult to find the right frames for you. Live in these glasses; see your own story unfold. 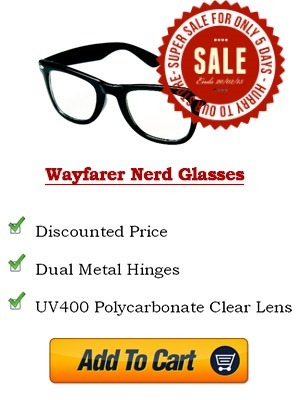 This entry was posted in Eyewear Brands by Nerd Glasses Fashion.